Choosing a gift for a genealogist can be puzzling. Loved ones and, especially, relatives want to be supportive but don’t know how. To those who search for that perfect idea, maybe one below will be right for your favorite genealogists. This is an update and consolidation of all previous lists. 1. If your favorite genealogists is interested in grave marker cleaning, D2 is a highly recommended product that’s a little inconvenient to get, so would make a thoughtful gift. The D2 manufacturer has some suggestions for where to obtain it. 2. Lifechat headphones for listening to webinars or group chats on the computer. 3. Eneloop rechargeable batteries by Panasonic, size AA, with a charger and case, would be good for a person who already has a Flip-Pal. Try Amazon or other retailers. I also like AA batteries that re-charge in any USB port. These would be great in a computer mouse, for travelers, in case the mouse batteries died. 4. USB flash drives. 8gb or 16gb should be fine. Look for sales. Genealogists need something large and bright so they remember to remove it from the computer. 5. This tech gadget holder, pictured, from Staples is useful and holds a lot; I saw it in-store. 6. 97.8% of genealogists love office supplies. OK I made that up. But check out this Colored Divider Sticky Notes Bundle from Amazon. And Redi-Tag Divider notes . Colored Divider Sticky Notes Bundle Set. Another Midge Frazel find. 7. This 2019 “Portable Office” double notebook/planner from Lee Valley looks pretty interesting. 8. Cotton archival gloves for genealogists (comes up on page two at link). 9. Genealogists love being organized (even if, well, they’re not!) Try the Brother Printer PT70BM Wireless Personal Handheld Labeler. 10. Clip board. A clipboard, a pad, and a pencil can be brought into most archives, even if nothing else can, and a clipboard serves as a writing surface when at a microfilm machine or library. 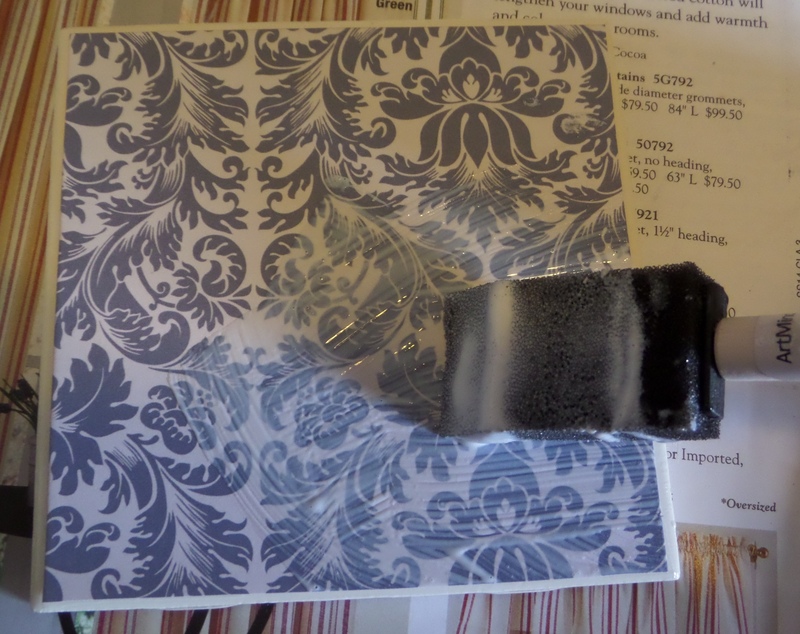 Try the thin printed ones at Staples but I also like this combination clipboard/mousepad. Add a bouquet of Black Warrior Pencils topped off with a 3-pack of White Pearl Erasers. I’m actually serious about this. I know genealogists. 11. Custom Genealogy Binders will be much appreciated by those who store research in paper binders. Personalized Genealogy Binders; you have a family name printed on the spine. Perfect for those who store a lot of information on paper. 12. Maybe a simple Canon Camera in the $100-$150 range. In the end, cheaper than paying for photocopies. “Image stabilization” is an important feature for people who are photographing pages and documents. 13. If your genealogist is not getting any younger, try magnifiers and magnifying lights. 14. Camera digital SD memory cards. And a little case to put them in, like this. 15. For the genealogist who serves as the family archivist (which is all genealogists), my friend Bernadine had a good experience with photo supplies from universityproducts.com, for instance, their archival storage boxes. When she phoned them, they were helpful. For modern sized photographs, these storage boxes are popular. 16. I like this Canoscan scanner for pictures and papers, but you might be able to find a cheaper one that you like. 17. I like my Flip-Pal mobile scanner – it runs on batteries and records onto a memory card – no computer needed until you are ready to review and store the pictures. Many genealogists really covet these. Desirable accessories would be rechargeable batteries and a case. 18. Family Photo Detective and many other works by Maureen Taylor help genealogists figure out those old family photos, and I also like Denise Levenick’s guide, How to Archive Family Photos: A Step-by-Step Guide to Organize and Share Your Photos Digitally. 19. Newly released in 2018, Kenyatta Berry’s The Family Tree Toolkit: A Comprehensive Guide to Uncovering Your Ancestry and Researching Genealogy. Kenyatta Berry’s The Family Tree Toolkit: A Comprehensive Guide to Uncovering Your Ancestry and Researching Genealogy. 20. Genealogical documentation is thoughtfully explained by Thomas Jones in Mastering Genealogical Documentation, published by the National Genealogical Society. An overview of the documentation/proof process which guides experienced genealogists is Thomas Jones’ Mastering Genealogical Proof. Both books are meant to be accompanied by the standard reference for genealogical documentation: Evidence Explained: Citing History Sources from Artifacts to Cyberspace, Third Ed Revised, by Elizabeth Shown Mills. Rounding out this list of must-haves, particularly for those with early New England ancestors, is Robert Charles Anderson’s Elements of Genealogical Analysis. 21. If your genealogist is a frequent public speaker, Tips & Quips for the Family Historian will help him or her with pithy sayings. 22. A reliable guide to those confusing DNA test results: The Family Tree Guide to DNA Testing and Genetic Genealogy by Blaine T. Bettinger. Also a moving book about the strange and unexpected news that DNA testing can bring: Stranger in My Genes by Bill Griffeth. 23. From 2017, the newly updated The New York Family History Research Guide and Gazetteer, published by the New York Genealogical and Biographical Society. This book is huge, and I mean huge. But awesome for those troublesome New York problems. Also check out “Research in the States” series from the National Genealogical Society for other states. 25. Looking farther afield for those ancestors? Try Genealogists’ Handbook for Irish Research by Marie E. Daly and The German Research Companion by Shirley Riemer, Roger Minert, & Jennifer Anderson. My friend Sara points out that with so many Irish records newly online, this is a great time to get going on your Irish heritage. Other suggestions include Finding Your Mexican Ancestors by George and Peggy Ryskamp and books by Sophie Hodorowicz Knab including Polish Customs, Traditions & Folklore. The Researcher’s Guide to American Genealogy. A new 4th Edition. 26. There is a new Fourth Edition of the classic work by Val Greenwood, Researcher’s Guide to American Genealogy. What a great opportunity to learn about American records. 27. If your genealogist is surrounded by books, there are some bookends with index tabs that won’t get lost when the shelves fill up. Actually, the Container Store has three styles I love: Index bookends and Mod bookends. 28. Genealogy Basics in 30 Minutes by Shannon Combs-Bennett is a new book that would help someone get started. Genealogists enjoy reading Family Tree Magazine. This is an especially good choice for beginners, and another recommendation for new to intermediate genealogists would be the book Family Tree Problem Solver by Marcia Hoffmann Rising. 29. Higginson Books is having a sale through December 31, 2018. This would be a good place to get a modern reprint of an old town history or family genealogy book. 30. Again for experienced folks, a membership in the National Genealogical Society will include a subscription to the Quarterly. 31. I always thought Ancestors of American Presidents, Second Ed, 2009, by Gary Boyd Roberts, was a really fun book. I’m only related to boring Presidents, though. 32. For Hispanic roots, try this guide: Tracing your Ancestors: Hispanic Research: A Practical Guide by Gena Philbert Ortega, published 2018. Genealogical Proof Standard: Building a Solid Case, 4th ed. The Great Migration Directory by Robert Charles Anderson. A complete list, in one volume, of persons in 10-volume The Great Migration series covering arrivals 1620-1640, along with brief citations. This just came out two years ago; very useful to have at home for deciding whether you will need to access the larger set in a library (see next item). NEHGS’ landmark series the Great Migration Begins – now in paperback – has never been more affordable and The Great Migration volumes are also now in paperback (each volume is also sold separately). Genealogist’s Handbook for New England Research, 5th Edition by Michael J. Leclerc. A guide to repositories and records. New Englanders in the 1600s: A Guide to Genealogical Research Published Between 1980 and 2010 by Martin E. Hollick (Expanded Edition). Locate research articles on families or locations of interest. A Guide to Massachusetts Cemeteries, 3rd Edition by David Allen Lambert is a brand new book, released in November, 2018. Having a reliable guide to the cemeteries is very helpful. 35. I love the work of the Gravestone Girls. I have a refrigerator magnet and a small plaque. 36. Lookup the historical society for an area your genealogist is researching and see what they offer – maps are always good. Also, the local genealogy societies usually offer publications or guides. For instance, the Rhode Island Genealogical Society has many valuable books and cemetery guides at their online store. 37. The idea of heritage cookbooks was sent to me by Wendy Grant Walter. She recently purchased Great German Recipes and said: “in it are many dishes that I remember having as a kid that I assume my mom learned from her 1st generation German mom.” At that same link many other cultures are covered, too. Also, Sophie Hodorowicz Knab has a cookbook, The Polish Country Kitchen Cookbook. 35. Barb’s Branches has some attractive tree jewelry in an Etsy shop. Among her interesting handmade “tree” pieces, she has the inspired idea of making jewelry from old silver spoons. Amazing! A pendant made from an antique silver spoon, by Barb’s Branches. 38. Every genealogist loves a beautifully executed family tree chart. Family Chartmasters, who work with genealogists to make beautiful custom wall charts, now offer blank charts in various sizes and formats. For a blank list-format chart for tracing up to 16 generations (back to, for instance, a Mayflower ancestor) this beautiful wall chart is from NEHGS. 39. The family genealogist wears too many hats. Family historian, archivist, photo restorer, report writer, researcher, local historian, cemetery rabbit. A gift that would be appreciated is an effort to collect and produce a small book on one aspect of your family history. Say, dad’s service in WW2, the relatives overseas from when you visited, or just everyone’s childhood. My sister does this from time to time and it’s great. No genealogy expertise needed, she asks me for pictures in advance, and the whole family gets a slice of its story without me having to do anything. 40. A similar option would be to find, scan and print a copy of an old family photo, and frame it nicely – perhaps in an antique frame. 41. Is your genealogist’s family associated with an old business or product? I saw on Elizabeth Handler’s blog From Maine to Kentucky that her ancestor produced a well known soap product, James Pyle’s Pearline, at the turn of the last century. Her brother, knowing her interest, gave her a gift of an original box. What a lovely memento. An online search reveals many advertising cards and images for this product, some of them from the Library of Congress and in the public domain. Such color images could be made into a cover for a blank book, calendar, or blank spiral notebook on lulu.com, or a custom deck of cards, or notecards, or just framed. An old ad for a product that is part of a family’s history can be made into a custom gift. This image was from the Library of Congress online Photo, Print, Drawing Collection. 42. 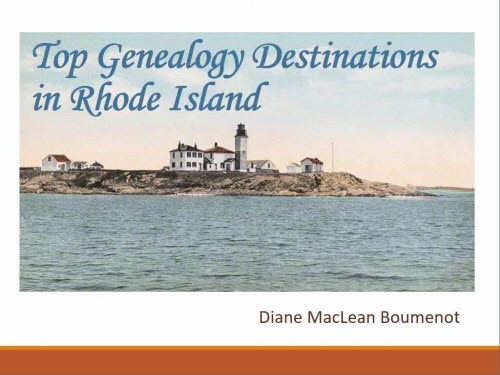 There is finally a “Research in the States” book for Rhode Island, published by the National Genealogical Society in 2018, and Maureen Taylor and I are the authors. I’m proud of this book, which will help researchers learn where Rhode Island records may be hiding, and why Rhode Island records are a little different than other states. The book can be purchased from NGS or from Family Roots Publishing. Research in the States: Rhode Island by Maureen Taylor and Diane Boumenot, 2018. 43. I heartily and strongly recommend the recent book Rhode Island in the American Revolution: A Source Guide for Genealogists and Historians by Eric G. Grundset for the National Society Daughters of the American Revolution (DAR Source Guides on the American Revolution Series No. 4), 2014. Quite a bargain at $25. It is 200 pages of guidance on where to find Rhode Island records from the 1770’s and 1780’s, but it will not contain the records themselves – most of those are buried in archives and manuscripts. 44. 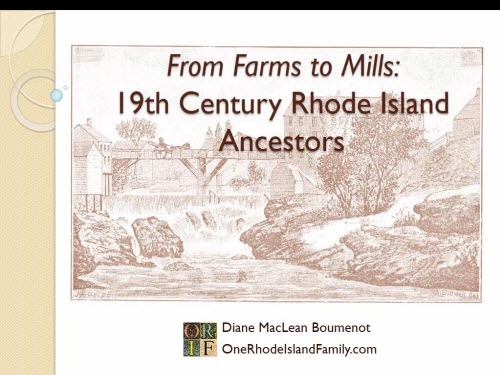 The most valuable book for those with ancestors in Rhode Island during the 1600’s is The Genealogical Dictionary of Rhode Island by John O. Austin, published by Genealogical Publishing. 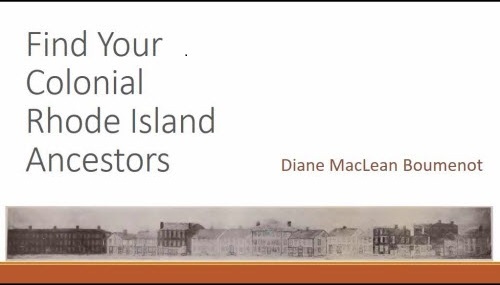 It charts the first three generations of many early Rhode Island families. You can sometimes find a cheaper used copy on eBay, but be sure to buy a version with additions and corrections from the 1960’s – 70’s. 45. The Rhode Island Historical Society has a bookstore at the John Brown House, and online, offering my favorite print of Providence ever, President Street by Joseph Partridge, 1822. I also love Market Square. Only $15 each. 46. 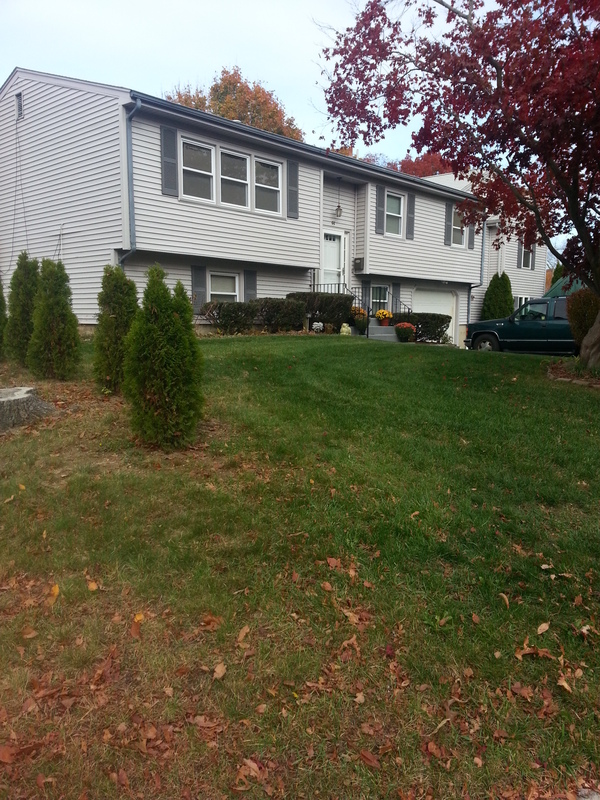 Spirit of 76 in Rhode Island by Benjamin Cowell for listings of R.I. Revolutionary War soldiers. 47. Many Rhode Island history fans would love the book by Rhode Island post card collector Joseph E. Coduri, Rhode Island Towns & Villages: PostCard Views at the Turn of the 20th Century. 48. A gift membership in the Rhode Island Genealogical Society is a terrific gift for the serious Rhode Island genealogist. 49. For those new to DNA testing, and looking for an easy way to try it out, I could recommend an Ancestry DNA test kit. Your genealogist will use the kit to submit a sample (in fact, it will be important to the genealogist to choose WHO will be sampled) which will be analyzed, and the results, available online, will show an estimate of ethnic origins and links to other individuals. A better choice for the same money, for a genealogist who is more experienced, is the Family Tree DNA Family Finder test kit. Family Tree DNA gives enough information to more accurately allow you to estimate, if the right people are tested, the common source of your matches. Look for Black Friday and Cyber Monday sales. 50. Check out the Latest and Greatest gifts from Fun Stuff for Genealogists. 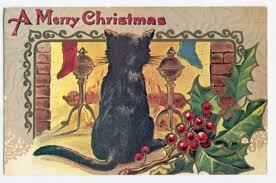 FREE FOR EVERYBODY: My vintage Christmas gift tag sheets on Pinterest, ready for printing. ALSO: Check out Anne Wagner (of Rhode Island)’s PDF handout on GIFTS GENEALOGISTS MAY WANT TO GIVE. I may try some of these! 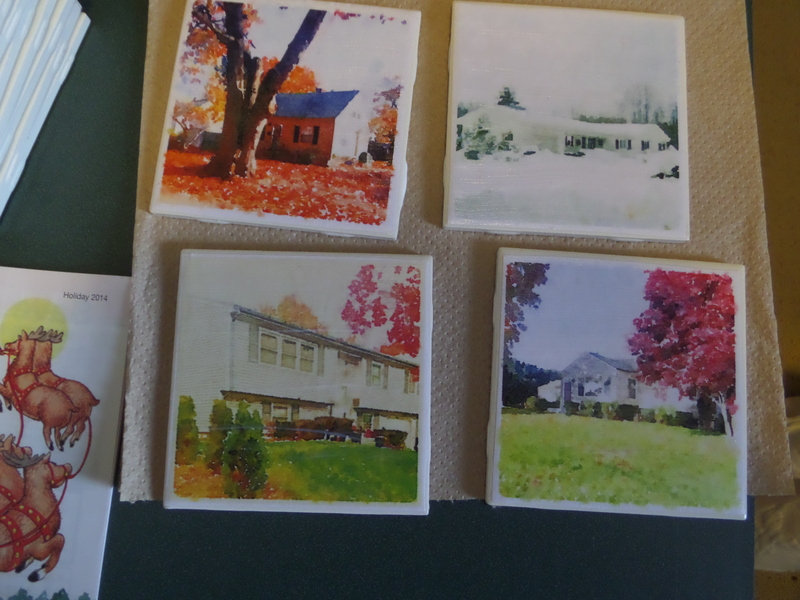 I had the idea while writing my 50 Gifts for Genealogists post of making tile coasters with old photos. I got some inspiration from this post I saw on Pinterest from Boxy Colonial, as well as several other Pinterest examples, but I also improvised. I thought I would like to use family photos, but not of people. I ended up doing two variations of this: old New England houses that had belonged to my direct ancestors, and, at my daughter’s suggestion, the four houses that my parents owned before their present house. 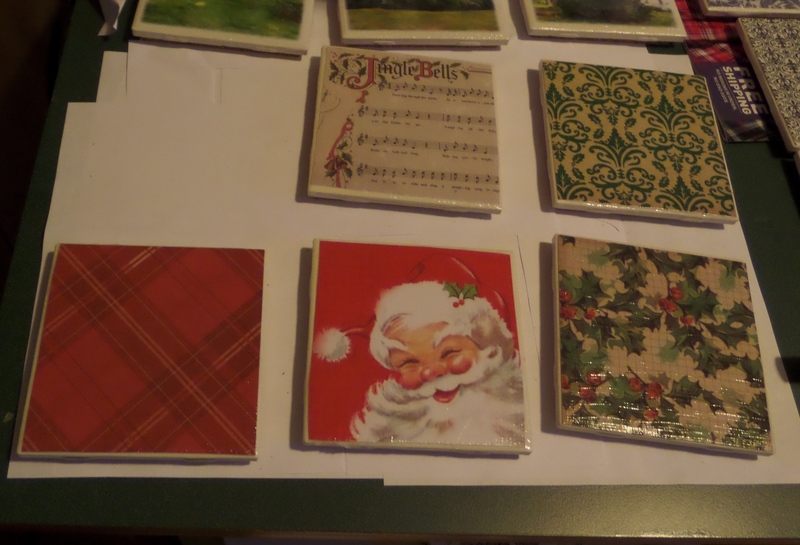 I also bought scrapbook paper and made some with Christmas themes, and some for year-round. I had taken pictures of the historic houses I wanted to use. For my parents’ houses, my daughter had one picture that was suitable, and I went out while the leaves were still on the trees to photograph the three other houses, which are nearby. Former house on Waterman Avenue, Warwick, R.I.
make them just under 4 inches in size (for this, I actually needed to take the edited pictures and move them onto a blank Word document, then resize. I printed on a normal color printer, on copier paper, from there). I could handle the cropping and resizing, but I got my daughter to use a special app called “Waterlogue”on her iPad to make the “watercolor” effect on each picture. 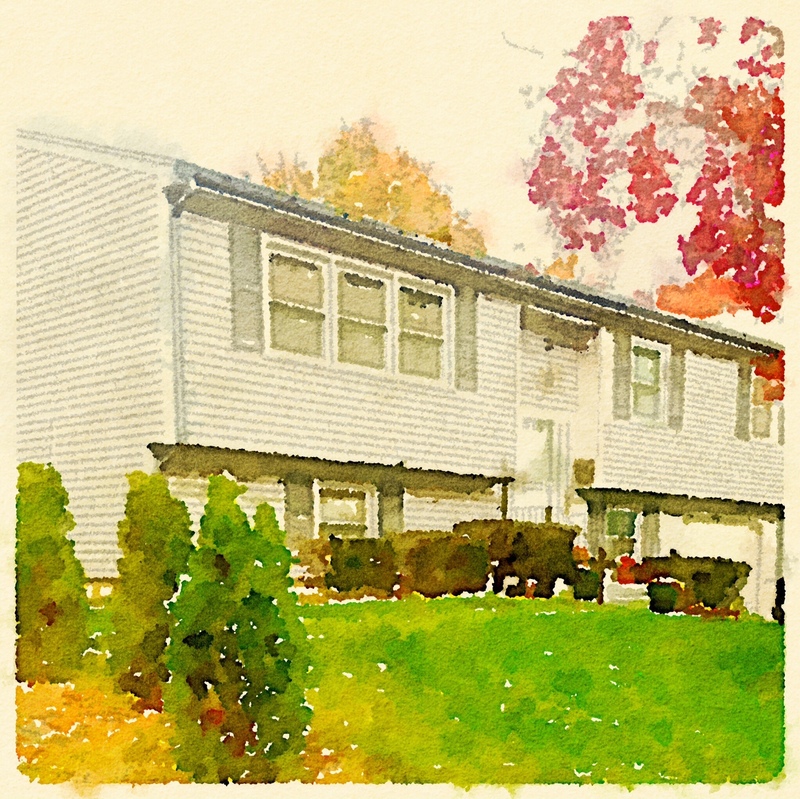 The square, resized, watercolored picture of the Waterman Ave house. 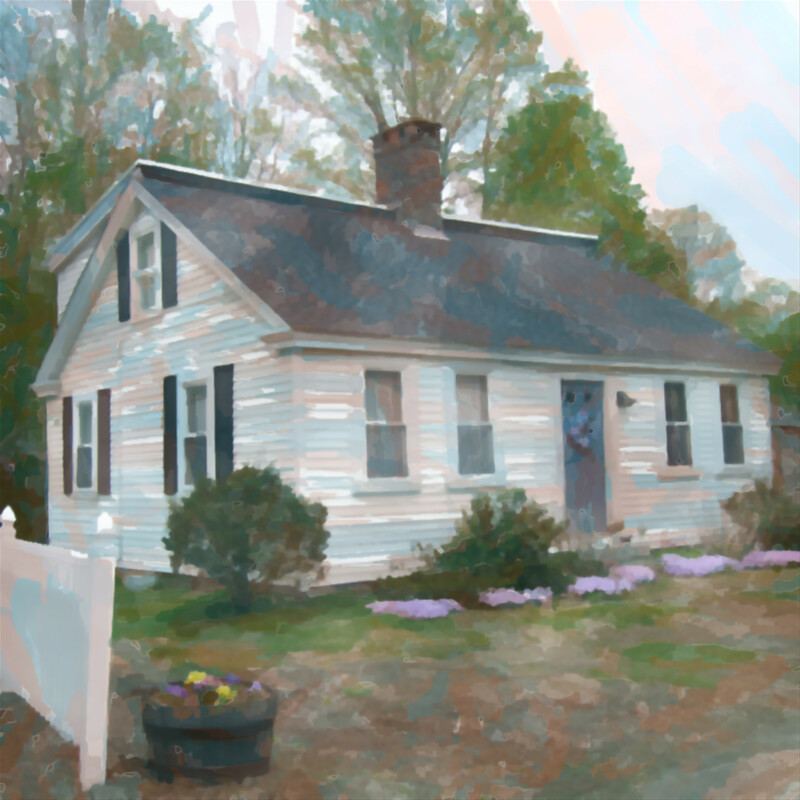 For the historic houses, I wanted to get those done on my own, and I downloaded a free one week trial of AKVIS Artwork 8.1. It was fairly easy to use. Editing one of the historic pictures using AKVIS Artwork 8.1. The watercolor version of the historic house in Sheldonville, Mass., built by my 5th great grandfather Nathan Aldrich and his father, Asa Aldrich about 200 years ago. 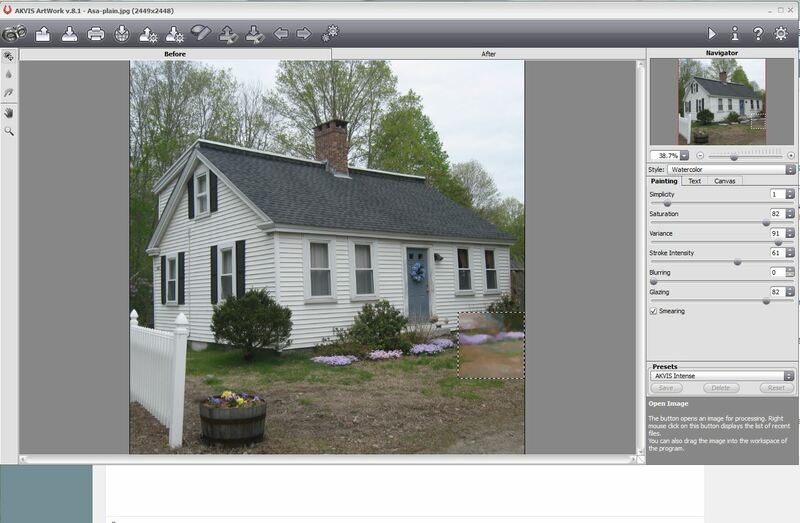 I also used Paint to retouch the photos, eliminating a few window air conditioners and other modern touches. I moved the pictures into Word when I was finished editing them so that I could size them exactly, in inches. Then I printed them. I measured them against the tiles and cut them out with scissors. 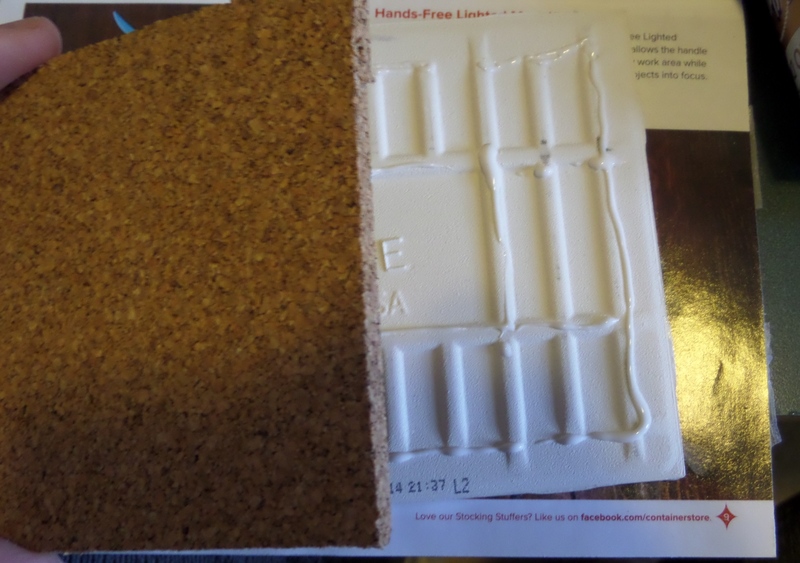 We already had glue and some quarter inch cork sheets around the house. I covered the tiles with Modge Podge, placed the picture on top immediately – you can wiggle it at this point, but once you let go, you can’t really move it again. 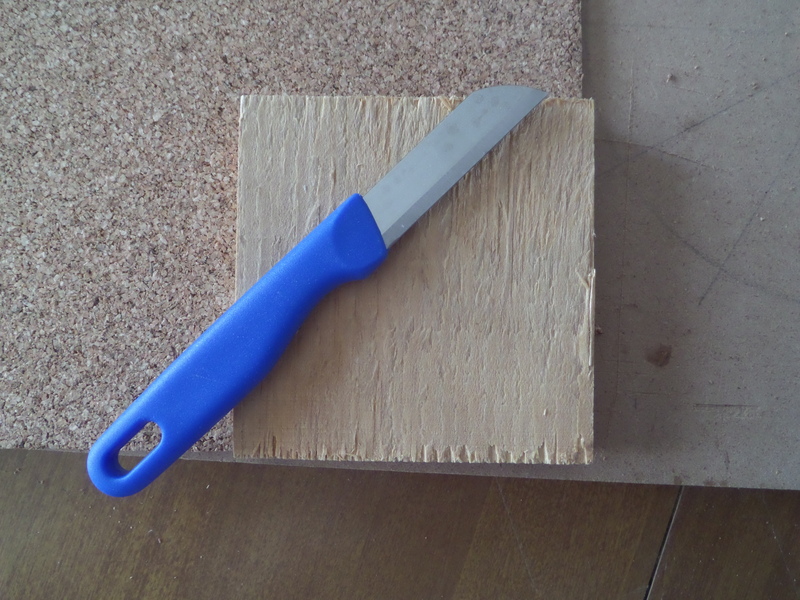 Then I coated the top of the picture with Modge Podge, being careful to make sure each edge was held down firmly. Modge Podge going on one of the scrapbooking paper tiles. It dries clear. Along the way of all that Modge Podging and drying, I cut the cork for the backs, and began applying the backs just before the last coat of Modge Podge. My husband made me a wooden template to use for the size I wanted the cork to be (slightly smaller than the tile) and I cut the cork with a knife. 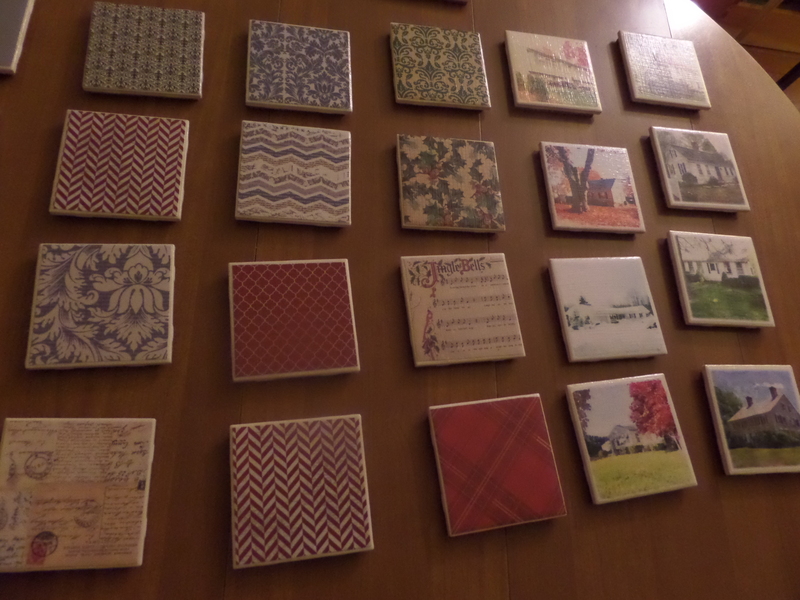 I glued the cork on the back of each tile. I just used Tacky Glue along the edge of the tile back, and on some of the raised areas; it worked fine. Gluing the cork on the back of each tile. The last step was to spray an acrylic finish on the tiles (the smell was really annoying!). Although that dried quickly, I plan to leave them out for a week or so before packing them up for gifts. 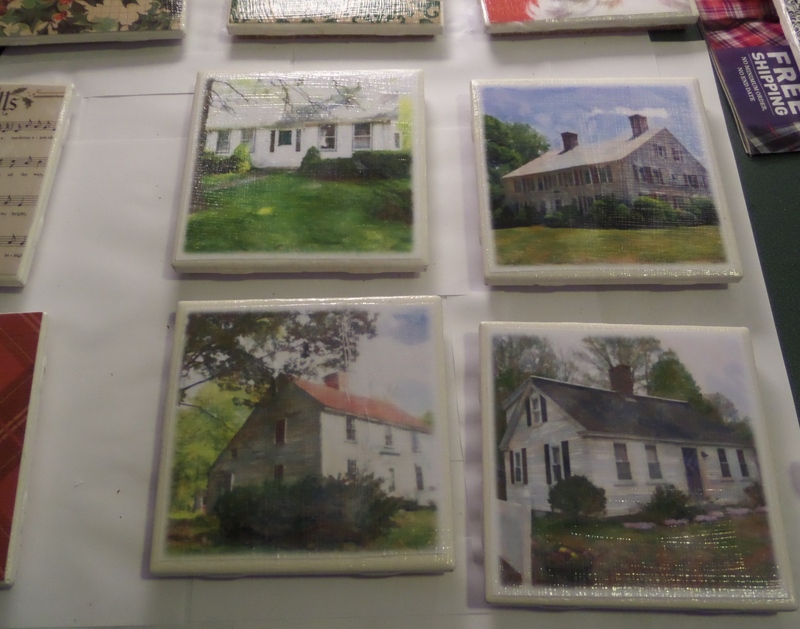 The finished tiles after the acrylic spray. I think the tiles made with scrapbooking paper are cute, but I think I would only be interested in doing these in the future with my own artwork or photos – that’s the fun and unique part. I was surprised to see that the Modge Podge didn’t damage the print at all on my copied photos. It worked fine. I made 25 tiles, and it took about a half day to take and manipulate the photos, and most of a day to make the tiles. I think I could do this faster next time.